Dear Black Men, I Love My Hue – Can You? How do you love someone who looks like you when you don’t even love yourself? While an abruptly harsh and even loaded question this may be I still believe it holds merit. There isn’t a day that goes by wherein we don’t look into the mirror, some of us more than others. We do this for various purposes from checking our makeup and/or hair to making sure no parts of our lunch are visibly showing through our teeth, to simply ensuring the sleep in our eye from the afternoon nap isn’t a visible distraction for our next meeting or class. Regardless of the reason, outside of a not-so-great day, we rarely look into the mirror and declare we’re anything less than fierce before putting it down. Sidebar, if no one told you you were beautiful today, YOU ARE, and let no one tell you differently. Many of us from an early age were told we were beautiful – in all of our pigmented and curvaceous splendor. We were taught that our skin was envied by those with less melanin, and that our hair and measured dimensions were traits our strong African ancestors had passed down from many a generations. But it seems in this day in age our black men have missed part of the memo. Though an only child, I grew up in a family where different hues of the rainbow were nothing less than ordinary. Nonetheless, at an early age, society introduced me to the idea of ‘light was right’ and ‘the darker you are, the less envied.’ I really didn’t understand this juxtaposition at the time – in my eyes if you were Black, you were Black – the idea of one shade being greater than, less than, more attractive or less appealing than the other seemed foreign, but I do recall times when I looked at my darker black sisters and asked myself if she felt as “ugly” as others would try to say she was simply because her skin was darker. Then the other part of me envied the silkiness of her dark skin – it reminded me of velvet, stunning in every way. I’ll never forget sitting in my 8th grade Social Studies class in the midst of a group assignment with three or four boys discussing who the “cute” girls in the class were and realizing that everyone named was categorized as a “redbone” – fairly light to caramel at most – with long curly hair, big butts, and small waists. A few of the mulatto girls were also thrown in the mix, but none of the darker complexioned females were mentioned. I remember anxiously and annoyingly blurting out, “yall need to expand your horizons!” partially because the conversation was irritating and partly because I wasn’t named amongst the talk of those “pretty,” “bad,” or “hot girls.” It was strange – there I was sitting annoyed by the immaturity of my male peers, while also feeling insecure that I wasn’t good enough because my hair wasn’t a “right” texture, and my curves weren’t to their liking, and my skin wasn’t the pretty shade. It’s one of the first times I can remember a feeling of less than and not feeling good enough. The boys simply laughed it off, but after class one stopped me and asked if he could tell me a secret. Because of the awkwardness of adolescence, I really didn’t know how to feel about this “secret” but because he was someone I considered a “friend” I said sure. What he said next blew my mind. He confided in me that in his honest opinion he thought dark-skinned women were the most beautiful women on the earth “like Alek Wek dark, but I can’t tell my boys that,” he said. At first I was puzzled and I’m sure my face showed it amidst all my silence. He proceeded to walk away and I blurted out, “why can’t you tell them that?” and he responded, “Because I can’t. And if you do, I’ll deny it so don’t.” I was at a loss in so many ways. You can’t tell your boys you think dark-skinned women are attractive? Why not? What’s the big deal? Looking back, I understand – darker skin and features have been shunned in society and deemed “unattractive” and “undesirable.” Though my 8th grade friend’s thinking was foolishly ridiculous I can see how it’s manifested even today – 15 years later. It can be hard to find authenticity in the overly artificial world we live in. Society seems to have set such unreal standards that the expectation of meeting them is almost impossible and the ones who do fit the mold make it utterly unachievable for us “average” folks. Maybe this is one of the issues that plague our black men today – the ideas of beauty that society has painted don’t really fit what’s popular and common. Society highlights the exotic, unfamiliar, and uncommon and makes it spectacular. Most of the black men I grew up with weren’t surrounded by women who looked like they walked straight out of travel magazine to the Caribbean’s nor did their mothers, sisters, aunts, cousins, or grandmothers have blue or green eyes, naturally wet and wavy hair, nor were they built with the perfect dimensions. But, that’s what they see on television – in the music videos – listen to in song lyrics on the radio, and are taught to envy and lust over. If I had a dollar for every time I heard a black man talk about how beautiful “light-skinned” women were in comparison to “darker-skinned” women, I’d have quite a bit of savings. I can’t number how many times I’ve witnessed, whether in person, or in reading, that lighter skinned women, with light eyes, and curly hair represented the epitome of perfect – the prototype. The more “exotic” the female the more attractive she is. It’s truly disheartening. I don’t say all of this to throw any form of shade on any black woman, we’re all beautiful and unique in our own way, but I say it to highlight how unfortunate it is that we’ve been taught to love one and hate the other simply because of how we do and don’t look or appear to be to the natural eye. I grew up in a household where my father never hesitated to tell my mother how much she meant to him, how beautiful she was, and how he didn’t know what he would do without her. He’d leave her random notes around the house and in her car that at times read nothing more than, “I love you.” He’d always do the same for me – telling me how precious I was to him, how proud he was of me, how I was a beautiful young girl developing into a beautiful young lady. I cherished those notes and those words. Never once did he highlight a physical trait of mine or my mother’s and define how THAT made us beautiful. To my father, we were beautiful because of WHO we were and who we were growing to be. My mother wasn’t always so vocal about her adoration and appreciation of my father, but she showed it in more tangible ways – she took care of our home and it was always tidy, we always had food to eat, his laundry was always done, his medications were always picked up from the pharmacist, and so on and so forth. Now that I’m older I see many of my fellow sisters holding down the home-front in some of the same ways, but our black men don’t reciprocate the love. I’d hasten to say that many of our black men nowadays aren’t taught to appreciate black women the way they were 15 and 20 years ago. Our women are oftentimes described in terms of physical beautiful while our intellect, our aspirations, our goals in life are made null and void. Why is this? Can we not be beautiful because of our minds? Do our aspirations hold no weight? I’m quite aware that the generation of today is far different than that of my parents and that as times change, society does too, but where did the glitch in the matrix take place? Where did our young men stop appreciating us for who we were and start lusting over us simply for what we looked like and what we could do for them? When did we accept societies norm for us instead of rejecting it and embracing that there’s beauty in every shape, in every hue, in ever coil, in all parts of our blackness? Maybe our men have lost their way and forgotten how to respect, love, admonish, affirm, and adore us, but it’s okay for us to teach them again. Love, affirmation, and respect aren’t incumbent upon the tone of our skin, or the texture of our hair, regardless of what society says. We teach people how to treat us – let’s teach all of our black men to love again. 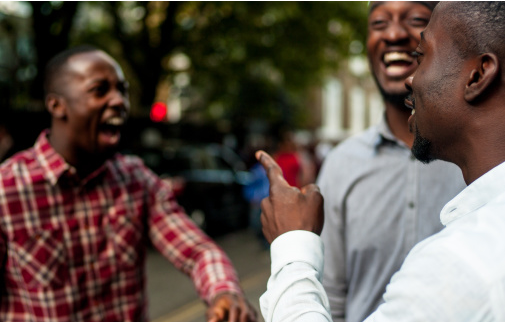 5 Comments on "Dear Black Men, I Love My Hue – Can You?" Deep….and well written. It it amiss because of just what you hinted at; the lack of instilling it into black men due to the broken family structure. Even you can revert back to the example your parents laid as reference…unlike scores of black men coming from different environments. Beautiful reflection. This should make each of us look into our past, present, and future and to truly love ourselves and learn from our history. Without knowing the past, we cannot truly appreciate the present. Aesthetic/Beauty. White racism continuously chipped away at our positive perceptions of ourselves. We must bring back the Black Is Beautiful Movement and this time it cannot be a fad. We must embrace our beauty on a daily basis, on an individual basis and through the media. Stay Strong.Be Blessed!